I have a sentimental connection to this edition of the Talisker 25, as a generous group of friends made a surprise 40th birthday gift of it to me a few years ago. It was the first older Talisker I’d ever had and the first older whisky from which I began to get an inkling of the effect of the variable of time on whisky made in more or less a similar manner at the same distillery. There is a very clear family resemblance between the Talisker 10, the Talisker 18 and the Talisker 25s (with the 18 usually containing the most sherry influence) and the Talisker 25 in many ways tastes like a much older version of the 10 yo. This may seem like a somewhat obvious thing to say, but distilleries don’t always present similar profiles between their entry-level and older expressions (see my recent review of the Laphroaig 25, 2009 ed., for example, or see the vast difference between the now discontinued Springbank 10 and the richly sherried Springbank 18). Another way to put this might be to say that if you are looking for a refined older statesman, this is not the 25 yo whisky to buy—it is certainly more elegant than the 10 yo but is still rough around the edges in the Talisker manner. 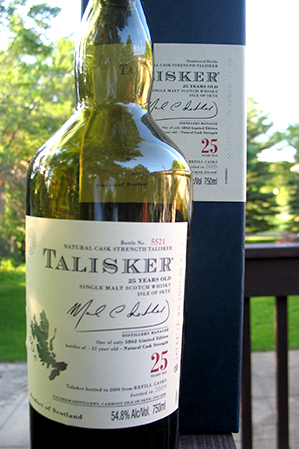 Until a year or so ago the 2004, 2005 and 2009 editions of the Talisker 25 used to be easily available in the US for <$200, and were, in my opinion, a steal at the price. Now the 2004 is all but gone, and the 2005 and 2009 are harder and harder to find. And as of 2011 Diageo has lowered the abv of the Talisker 25 to the standard 45.8% of the regular line, and prices have gone up too. The lesson, as always, is that if there any bottles from Diageo's classic distilleries that you really like, you should stock up on them when you see prices you like. Palate: Sweet peat followed by the classic Talisker pepper, followed by sweet peat again. Some savoury gunpowder as well, and then expanding salt. The palate doesn’t develop quite as much as the nose with time. Let’s see what water does: it makes it very minerally and quite austere. The peat is dryer too now and there’s some leafy smoke. After a little bit the peat gets a touch phenolic. Finish: Long with expanding heat. Pepper and salt. The finish doesn’t change very much with water. Wait, that’s not true: there’s more peat on the finish too now, and well after the last sip a mildly ashy aftertaste develops on the tongue. Comments: If your frame of reference for Talisker is the excellent 10 yo you might be surprised, and possibly disappointed, by the relatively laid back character of this 25 yo. There is nothing rough about it, though that’s probably not a surprise after long aging. At the same time, it’s not a highly refined elder statesman either—the familiar Talisker bite shows through every once in a while. It does need time to unlock all its qualities, and the nose shows interesting development with a touch of water. I don’t mean to give the impression that I’ve had a lot of older Taliskers or Broras (at this point, the only Broras available are old Broras) but this edition of the Talisker 25 seems quite close to the non-heavily peated Broras from the late 1970s and early 1980s that I’ve had the good fortune to try. Of currently active distilleries I’d put this profile in a continuum with Clynelish and Longrow. This entry was posted in -Whisky by Rating, 85-89 points, Talisker. Bookmark the permalink. Springbank 10 has been discontinued? I should have specified that I was referring to the 100 proof 10yo, which was all ex-bourbon in the UK and EU; that one, I believe, has been phased out in favour of the 12 cs which is all ex-sherry. I believe the 50% abv US 100 proof sold here (which was not all ex-bourbon) is also phased out. Not sure of the fate of the regular 10 yo. How do you like this compared to the 2005 version? Haven’t had that one in a long time (my current bottle is closed) so it is hard to be specific. For what it’s worth, in my spreadsheet they have more or less the same score. I don’t think there’s tremendous variation between the Talisker 25s. I’ve been buying them when I can afford/find them because I like the Talisker profile so much and they don’t put out a wide range of expressions (at least not until all these new NAS releases started showing up recently); and until recently, these 25s were such good values. I’d saved 2 ounces from this bottle and finished them up tonight. And I can confirm that I did indeed give this too low a score. 90-91 is where I would put it tonight without changing my notes too much. Just lovely whisky. Happy that I have one bottle remaining in my stash.